An imposing bronze case, a wide ratcheted easily adjustable crown, oversized luminescent numerals and a high-beat El Primero mechanism: the new 'Pilot' by Zenith proudly flaunts the DNA of a line of airborne conquerors. – sports the vigorous typology of these iconic pilot’s watches. Framing an oversized luminescent display guaranteeing peerless readability, the substantial 45 mm-diameter case – featuring a large screwed-in crown and ratcheted pushpieces facilitating adjustment with gloved hands – is made of bronze: a highly resistant antimagnetic alloy that acquires a natural patina giving it a unique vintage touch. Topped by a domed sapphire crystal, the new sandblasted black dial picks up the font of the original large Arabic numerals, made from blocks of white (green-emission) Super- LumiNova® SLN C1. The luminescent facetted hands sweep over this distinctive watch face, also punctuated by two counters and a railway-type minutes track. 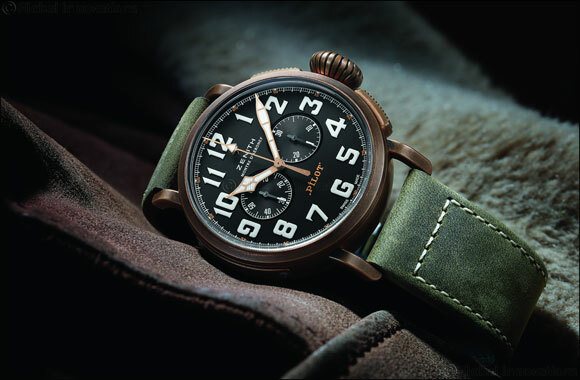 The inscriptions “Montre d’A�ronef” and “Pilot” are a reminder that the Manufacture was one of the first producers of altimeters and cockpit watches at the dawn of military and civil aviation. At the heart of its 100-metre case hums an ‘engine’ known for its legendary precision: El Primero Calibre 4069. This high-frequency column-wheel chronograph movement is a descendant of the world’s most accurate series-made chronograph, developed by Zenith and presented in 1969. Beating at a rate of 5Hz enabling a tenth-of-a-second display, it drives the central hours and minutes, small seconds and chronograph functions, while ensuring a 50- hour power reserve. In a nod to its aviation origins, the solid titanium case-back depicts the plane flown by Louis Bl�riot when he crossed the Channel in 1909 with a Zenith on his wrist, along with the Zenith flight instruments logo, complemented by a motif inspired by the fuselage of the legendary French pilot’s aircraft. Built for exploring far horizons, this Pilot Extra Special is harnessed to the wrist by a khaki green oily nubuck leather strap with beige stitching, rubber-lined and secured by a titanium pin buckle.